Sound "Abundant naturalness, spatial bloom, and image heft" -- "music just flows"; " the DAC2's midrange displays plenty of body amidst an overall neutral signature"; exceeds the DAC1 "at the frequency extremes," yielding "meaningful improvements to the sound of an already fine product." Features "A totally new design from the SP/DIF input to the RCA outputs" that features 24/192 upsampling capability and improved jitter rejection. Use Marc found that the coaxial input sounded better than TosLink "no matter the transport or cable." Value Same $1300 list price, refinements and all. How time flies. It seems like yesterday that I was reviewing Bel Canto's diminutive DAC1, and perhaps this is so because I've used the DAC1 (and subsequently the DAC1.1) as a reference since my review. I loved the DAC1's easy-on-the-ears sound, and the ability to decode 24/96 software opened me up to the various great-sounding DVDs available from Classic Records, Hi-Res Music and Chesky. The DAC1's performance and price made it a no-brainer Reviewers' Choice, and at the 1999 CES, we presented Bel Canto our Innovation in Design award for the DAC1. 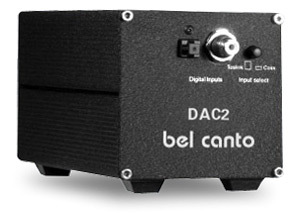 So with all this going for the DAC1, why has Bel Canto replaced it with the new DAC2? A company has to keep its product line fresh to maintain brisk sales, but in the case of the DAC2, there were a few circuit changes that John Stronczer, Bel Canto's head designer, wanted to implement as well. Chief among these was an upgrade from the DAC1's Crystal 8420 sample-rate converter to one from Analog Devices, the AD1896, which allowed true 24/192 conversion/upsampling and an improved signal-to-noise ratio. The AD1896 also includes a dual-rate digital phase-locked-loop function, which in the DAC2 is used in conjunction with a dual-stage dejitter circuit in the new SP/DIF receiver from Burr-Brown for improved jitter rejection. Stronczer then chose a new multi-bit, dual-differential, sigma-delta DAC from Burr-Brown, which he calls "a remarkable device" providing "the best of multi-bit and single-bit technology in a small, low-power package." Because this DAC operates full time at 24/192, Stronczer was able to eliminate analog-filter components from the DAC1's design. The DAC1's slow-roll-off filter remains and now operates at 96kHz, eliminating the need for a standard brickwall filter and the time smear that goes along with it. Bel Canto tied the circuit together on a four-layer PC board with multiple regulated power supplies, dual regulation for the DAC stage, and an improved overall layout. "It is really a totally new design from the SP/DIF input to the RCA outputs" is Stronczer's assessment. Seems that way to me too. The DAC2 retains the DAC1's profile and weight -- 3 5/8"H x 3 5/8"W x 9"L and a mere three pounds -- but it omits the DAC1's phase-inversion switch (it's now a switch for choosing which digital input to use, coaxial or TosLink) and the golden Bel Canto badge on the side. The IEC power-cord inlet and status LED remain. Like the DAC1 and DAC1.1, the DAC2 can decode 24-bit/96kHz signals from DVDs -- so long as your DVD player can output this data and you've enabled the output via the onscreen menus. More than a few people have written me to ask how to do this, and the answer is always the same: Consult the manual that came with your DVD player. Unlike the DAC1 and DAC1.1, the DAC2 upsamples standard 16-bit /44.1kHz digital to 24 bits and 192kHz, which along with the new DAC chips and improved jitter rejection should make for improved sound -- should. The DAC2 is virtually the same price as the DAC1 -- $1300 USD -- but $100 less than the DAC1.1. The DAC1's lifetime warranty has been reduced to five years, still a good long time. The cost of upgrading a DAC1 to a DAC2 is $850, which includes replacement of the entire circuit board, power supply and both chassis end panels. Upgrading a DAC1.1 costs $700; the power supply is not replaced. The DAC2 took its place among a distinguished group of audio components: Wilson Audio Sophia and WATT/Puppy 6 speakers, Revel Ultima Studio speakers, Wilson Audio WATCH Dog subwoofer, Lamm ML2 and Tenor Audio 75Wi mono amps, Lamm L2 and Audio Research Reference Two Mk II line-stage preamps. The spinning end of the digital setup was either a Mark Levinson No.39 CD player or a Pioneer DV-525 DVD player. Interconnects and speaker cables in use most of the time were from Acoustic Zen (Silver Reference and Satori), Shunyata Research (Aries and Pegasus) or Analysis Plus (Solo Crystal Oval and Solo Crystal Oval 8). Power cords were from Shunyata Research -- for the most part, Taipan on the amps, Anaconda Vx on the preamp, Python on the DACs and transports. Everything was plugged into either a pair of Sound Applications XE-12 conditioners that used 20-amp Elrod Power System EPS-3 power cords or a Shunyata Hydra with an Anaconda Vx going to the wall. For comparison, I had on hand my Bel Canto DAC1.1, which was updated from a stock DAC1 a little over a year ago. Bits were sent to the DACs via DH Labs D-75 or TARA Labs RSC Air 75 coaxial digital cables, or for a short time Monster Cable or Acoustic Research TosLink cables. With the DAC1, Bel Canto made a point of urging buyers to at least try a TosLink cable, and as I found out, with a Pioneer DVD player as transport, the DAC1 sounded better via TosLink -- "smoother and darker." The same is not the case with the DAC2, however, which I preferred via the coaxial connection, no matter the transport or cable, because of the greater openness and slightly better resolution. Perhaps the DAC2's new SP/DIF input receiver and scheme for handling jitter have caused coaxial to stand out, or perhaps my tastes have changed. I stick by the impression that the DAC2 sounds better via coaxial input, and in this regard, try the DH Labs D-75, an inexpensive silver digital cable that's within shouting distance of the very best. As long-time readers may recall, at the time I reviewed the DAC1, I owned a Timbre TT-1 DAC, which I absolutely loved. The Timbre's analog-like sound was always pleasurable to the extreme, and I found in the DAC1 a good many traits that I also admired in the Timbre DAC. This has also happened with the DAC2, but with a twist. The DAC2 retains much of the sound that made the DAC1 so successful but also improves on it in a couple of key ways. Like the DAC1, the DAC2 is forever easy on the ears, never teetering over into the realm of even marginal digital sound. With the DAC2, long listening sessions are common because of its abundant naturalness, spatial bloom, and image heft. A recording that demonstrates all of these at once is John Hammond's Wicked Grin [Pointblank 7243 8 50764 2 8], which is a collection of Tom Waits songs done in a more straightforward blues style and produced by Waits himself. We named Wicked Grin one of the best recordings of 2001, and it deserved the honor. I've recommended it to three people, all of whom bought it and love it. Hammond's voice leaps from between the speakers surrounded by a wide and deep soundstage populated with weighty sonic images. The DAC2 unravels and translates it all with ease, not making it sound overly busy or congealed in the process. The DAC2 is musically detailed -- you hear everything a CD has to offer, but not in an intrinsically hyped way. Via the DAC2, the music just flows. The DAC2's midrange displays plenty of body amidst an overall neutral signature. Voices are presented with a certain just-rightness that helps them not stand out in their own right. Joe Louis Walker's growling on "In the Morning" from his Telarc debut CD of the same name [Telarc CD-83541] is clear and impassioned. But the DAC2 does well with more gentle vocals too, such as Norah Jones from her Come Away With Me [Blue Note 7243 5 32088 2 0], which, I've discovered, polarizes listeners. Count me among those who think Jones has a certain something that's highly listenable, and via the DAC2 her non-acrobatic style emerges with analog-like naturalness and digital-like microdynamics and tonal shading. She doesn't over-sing any song, and I suspect that this is the rub for some listeners, those who find her too cool and detached in a posturing kind of way. No matter -- the DAC2 helps the debate rage on, perhaps even enhances it via its even-handed delivery. The DAC2's retrieval of detail is very good, although not up to the standards set by some of the best standalone CD players like the Audio Research CD3 or Mark Levinson No.39. The DAC2 is proficient at re-creating a credible soundstage in your listening space by presenting full, fleshy images, not by highlighting every small nuance. It doesn't give a microscope's view into music recorded on each disc, which can make certain CDs unlistenable. I've recently discovered that a few of my favorite LP-only recordings have finally made the trip to CD, and one of these is Mississippi Fred McDowell's I Do Not Play No Rock'n'Roll [EMI/Capitol 302 061 158 2], which oddly sounds somewhat like early digital -- hard and glassy in the upper midrange -- and not the recently remastered recording that it is. The DAC2 doesn't obscure the nature of this CD, but it also doesn't make it the first thing you notice. The music here, some prime Delta blues played by a master of the slide guitar, is still enjoyable, and I've listened to this CD enough times since I bought it to make up for all the years I couldn't hear it after going 100% digital. If you get a chance to sample I Do Not Play No Rock'n'Roll at Borders or Tower, listen to McDowell's monologue that opens the album, and then skip right to "Red Cross Store." If these don't make you want to buy the CD, the blues ain't for you. I also used the DAC2 to decode 24/96 two-channel DVDs, and the sound was everything I have come to expect from the format: better in meaningful ways than CD. The digital trouble spot in the upper midrange/lower treble, which gives certain CDs their glassy tinge, is completely absent on the 24/96 DVDs I've heard, and the greater sense of space and air are welcome additions to the sound. The DAC2's signature with CDs is not as prominent with DVDs, which are more wideband and recognizable as a high-resolution format. But the ease and flow are still there, especially on Terry Evans' great Blues For Thought [Classic Records DAD 1014], a reference-quality CD that is more spacious and even slightly more detailed on DVD. As you might suspect given the success of the DAC1, the DAC2 is not a radical departure from the digital sound Bel Canto has offered up to this point. In fact, the digital-to-analog converter that sounds most like the DAC2 is the DAC1, as both are still two of the most friendly sounding digital components I've heard. They both have the ability to draw listeners in, perhaps because they address so well the problems that listeners have identified with digital sound. I called the DAC1 "sweet, smoothly detailed, involving, organic, engaging" in my earlier review; all of these apply to the DAC2 as well, but with a few enhancements. The two areas in which the DAC2 goes beyond the DAC1 (and DAC1.1, which is a DAC1 with a power-supply upgrade) are the frequency extremes. The DAC2's treble is slightly more open, detailed and, to my ears, extended. This is most apparent on cymbals; those at the opening of "Three to Get Ready" from Dave Brubeck's Time Out [Columbia/Legacy CK 6512] are very telling. The DAC2's bass also has more grunt -- a combination of more power and detail. Suzanne Vega's Nine Objects of Desire [A&M 31454 0583 2] shows this in obvious fashion, but you will hear it as well with any disc that has plenty of diverse bass. I'm not talking about wholesale changes here, but rather meaningful improvements to the sound of an already fine product. I don't know if John Stronczer and crew identified certain sonic aspects they wanted to improve and then set about doing so via changes in parts and board layout, but this makes more sense given the close sonic outcomes than a radical redesign of the entire product just for the sake of doing it. In any case, the result is that a very good-sounding DAC has gotten a little bit better. Which DAC is for you? One of the biggest questions to address with this review is for owners of DAC1s and DAC1.1s. Should they upgrade? I'm not sure there's a more sure-fire way to get real improvements in the sound of your system than having Bel Canto do surgery on your DAC. You'll hear the sound I note, that's for sure. On the other hand, if you're enjoying the sound of your DAC1 or DAC1.1 now, why bother? You'll still have one of the most musical and listenable digital components around. I am glad, however, that in undertaking the upgrade of the DAC1 Bel Canto didn't muck up the sound one bit, instead creating a product that's a worthy successor. The DAC2 retains those sonic traits that made the DAC1 so successful and improves at the frequency extremes. Bel Canto also kept the price the same, although there is a rather steep charge for those DAC1 owners who want to upgrade. With all this in mind, I think it's clear that the DAC2 remains a Reviewers' Choice. I know it remains this reviewer's choice for two-piece digital playback.